Introducing the highest quality and most pleasurable Kava we've ever offered here at the shop: Vanuatu Noble. This Kava has a proportionately higher level of Kavain, one of the kavalactones associated with the pleasurable effects of Kava, partly because it encourages dopamine release in the brain. We already know that kava kava may help to manage everyday stress as well as reduce anxiety, while supporting your overall sense of enjoyment and well-being. * Here at Shaman’s Garden we feel that kava kava can be used to enhance your life, as a relaxed life may be a happier life. Never have we felt this to be more true than with this lateral-root only, Vanuatu Noble Kava Kava Root. Typically, the kava highest in kavain is the Hawaiian Kava Root, and has always been considered a very desirable drinking 'awa strain. Our personal favorite is the Mahakea cultivar, which most often has a 4-2-6 kavalactone lineup. That means it is high in kavain (4), dihydrokavain (2), and methysticin (6). 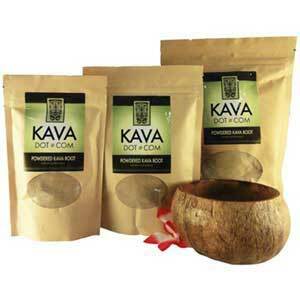 Kava Dot Com's Premium Vanuatu Kava shares a similar chemotype to the Hawaiian Kava we offer from Kona Kava Farm, making for an extremely pleasant Kava experience with virtually none of the undesirable effects often associated with less sought after kavalactone lineups. Dr. Vince Lebot authored the book "Kava: The Pacific Elixir" and is a leading researcher in the field. His colorimetric test has been used to get an idea of the possible cultivar of Kava, especially in relation to whether it’s a Noble variety of kava root or a lesser strain. This Vanuatu Noble kava passes the Vince Lebot Colormetric Test with flying colors. So, when we say that we feel our Premium Vanuatu Lateral Only Kava Root is the happiest kava root we have ever experienced, we don't make that statement lightly! This kava is the happiest kava we have ever encountered in our 20 years of kava passion!